In 1982 TVR’s current owner and chairman Peter Wheeler took over the company and in the next few years TVRs became faster and more sophisticated. 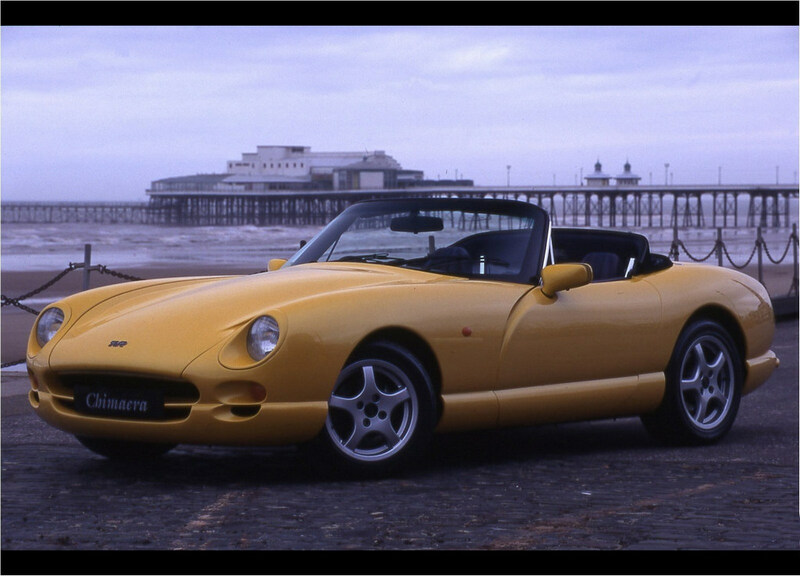 The TVR Griffith was basically the vehicle responsible for TVR’s renaissance. Overwhelmingly successful, the Griffith was delivered to customers at the beginning of 1992. Following this lucky strategy the TVR Chimaera was introduced at the 1992 Birmingham Motor Show and was instantly hailed a success again. The name Chimaera referred back to Greek mythology which speaks of a fire-breathing monster thus named with the head of a lion, the body of a goat and the tail of a serpent. 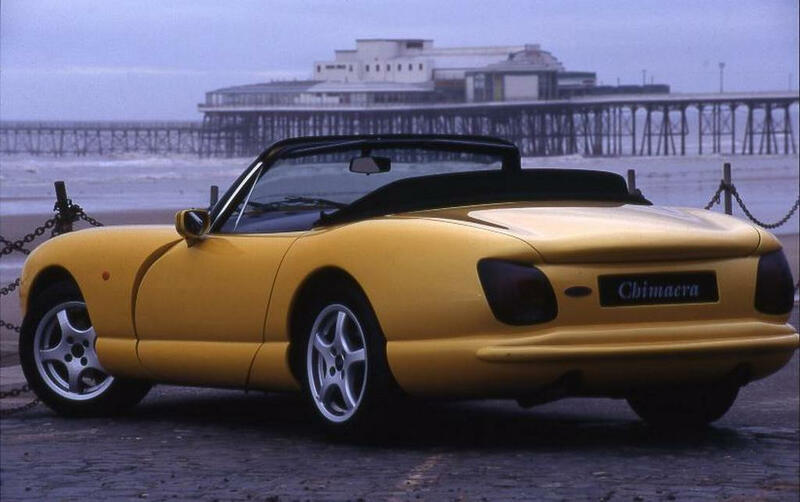 Based on the award-winning Griffith, the TVR Chimaera went into production in February 1993, then fitting into TVR’s model line-up between the TVR V8S and the TVR Griffith itself. 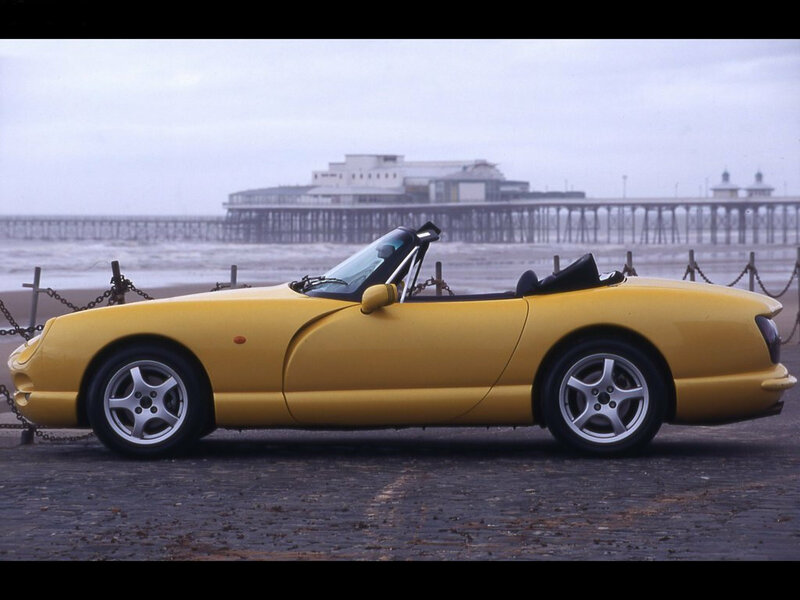 It was intended to be the long distance tourer of the TVR range. It was longer and more spacious with a slightly softer suspension than the TVR Griffith (but it shared a similar chassis). Despite this, it was still a formidable roadster thanks to the lightweight construction. 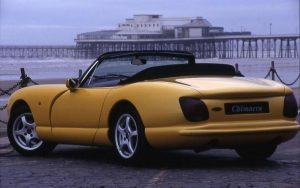 The TVR Chimaera used a steel backbone chassis with side rails to provide impact protection which was strong and transmitted no cowl shake. The handling was good, due to 50:50 weight distribution. With a ground clearance of about 5 inches, the suspension consisted of all round independent, unequal-length double wishbones and coil over gas dampers assisted by anti-roll bars. The engine in the Chimaera was a developed version of Rover’s all-aluminum V8 90 degrees while the TVR modified theirs by increasing the compression ratio to 9.8:1 then mapping their own engine management to aid in power delivery. the trusty Rover V8 (tweaked by TVR Power) was slotted into the Chimaera with a capacity of 4.0 or 4.3 litres. Again in line with softening the car, the 4.0 litre has a softer cam than earlier units, giving less harsh characteristics. A Rover gearbox, Sierra rear axle and a Quaife differential were employed. The Rover gearbox was replaced in 1994 by a Borg-Warner sourced unit. The 4.0 engine (3.950 cc) gave 240 Hp and 366 Nm at 4.000 rpm. Performances were obvious exciting: 0-60 mph in 4″7, 245 km/h. A “HC” High Compression version was avaiable: 275 hp, 414 Nm, 0-60 mph in 4″7, 254 km/h. The 4.3 engine (4.280 cc) gave 280 hp and 414 Nm. Performances were: 0-60 mph in 4″7, 254 km/h of max speed. The 4.5 litre engine (4.495 cc) gave 285 hp and 420 Nm, with the option of the 320 bhp powerplant out of the Griffith 500 (which was introduced in 1995). This gave effortless performance which fits the Chimaera’s dual role of Grand Tourer and sportscar. The front disk brakes of the TVR Chimaera are 260 mm in diameter and ventilated while the rear disk brakes are 273 mm in diameter. Both sets of the brakes are servo assisted with front/rear split dual circuits and there is a cable-operated hand brake for the rear wheels. Steering on the Chimaera is optionally power-assisted and works through rack and pinion with adjustable steering column. The Chimaera featured 2.2 turns lock to lock for the power-assisted steering or 2.5 if manual. 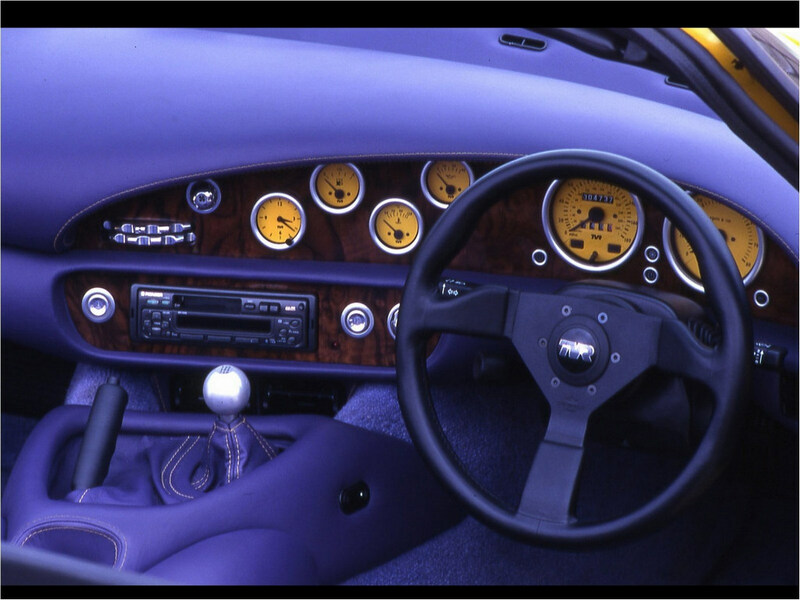 With the option of being customized completely by TVR, the steering wheel is 350 mm in diameter and leather-covered. Manufacturer’s options included power assisted steering, AC, rear speakers, six CD autochanger, full leather, heated seats, wood and chrome steering wheels, wool carpets and gold colored badges. Standard on 5.0, the seven spoke ‘Griffith 500′ wheels were available for smaller engine versions. 4,988 cc V8 that was initially a factory option on the 4.3 and 4.5 liter models. 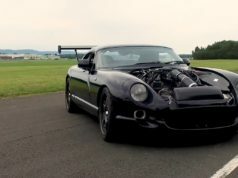 The most driveable old- school TVR, the Chimaera 450 still demanded extreme skill as it dispenses with most modern driver aids. The Chimaera 450 didn’t have traction control, or ABS, though it featured an engine that is bursting with torque. New at the 1996 Motor Show was a subtly revised Chimaera with a fresh nose and tail which brought it into line with the Cerbera. In addition, it now featured much of the extraordinarily high quality aluminium switchgear from its 2+2 sister as well as door opening buttons under the door mirrors. 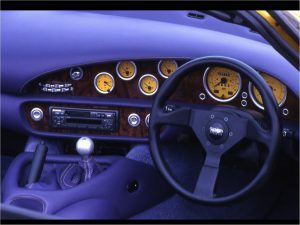 For 2001, the car had a revised front end again with covered headlights as well as having Cerbera seats fitted and the full complement of TVR’s much praised aluminium switchgear. While still very much a sportscar, the Chimaera is more of a grand tourer than any other model in the TVR range with somewhat more benign handling characteristics and a larger boot. However, the Chimaera’s handling has not been left to chance with a chassis developed directly from that of the racing TVR Tuscan. With strong ventilated disc brakes all round, the Chimaera stops as well as it goes.